The theme for the Improv Challenge this month is “ebony and ivory”. I had absolutely no idea what to make using something black (brown) or white (ivory) so I decided to pick Tom’s brain. 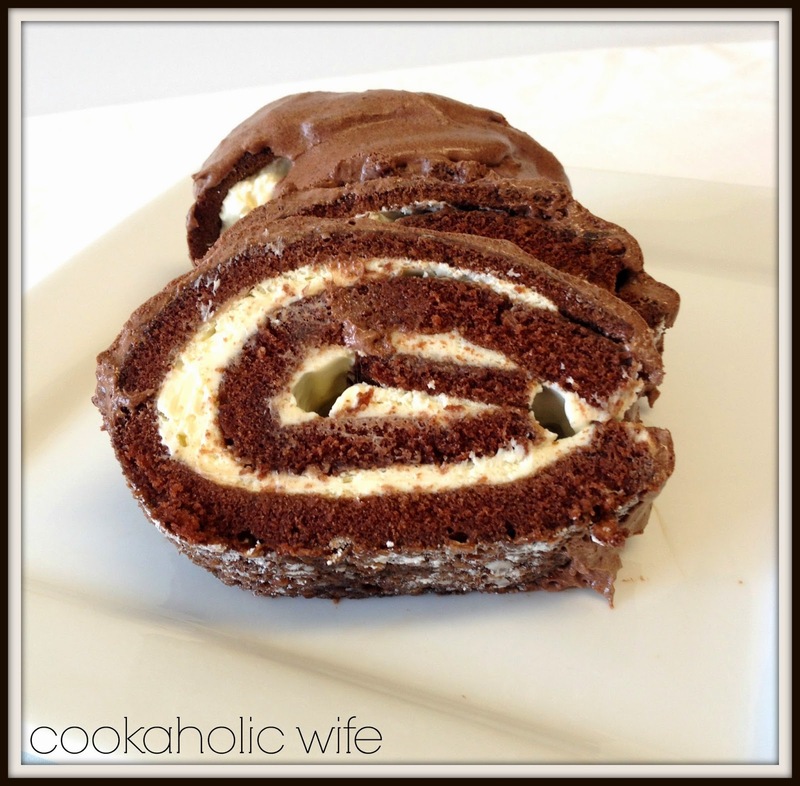 We went through a bunch of different ideas and finally he decided that I was going to make a swiss roll cake. To be honest, I am not a swiss roll cake fan. I think they’re pretty but I’m just meh on the flavors. Probably because I am one of those rare people in life who doesn’t really care about cake. Ice cream cake…now that’s another story. 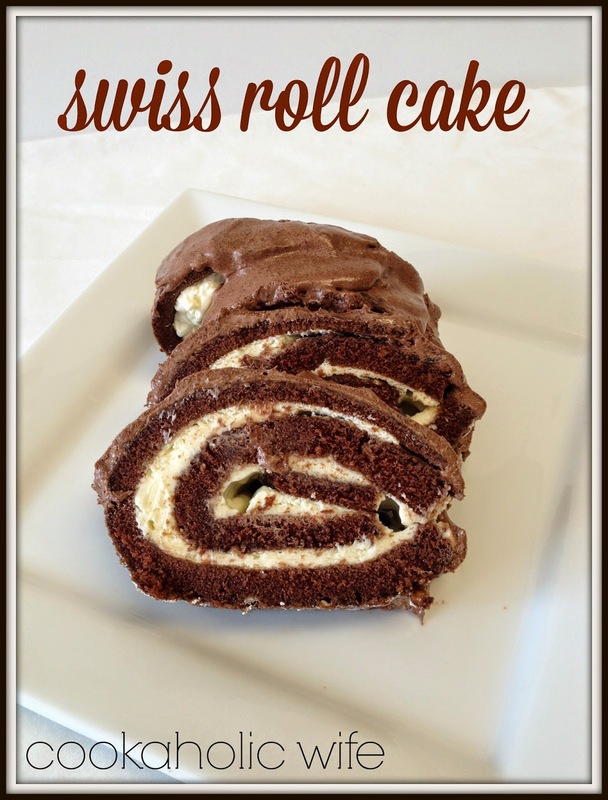 But because I enjoy a challenge and rolling up a cake, then unrolling it and adding frosting, then rolling it again is definitely something I consider to be a challenge, I agreed that a swiss roll cake is exactly what I would make. Finding another recipe proved to be a bit more difficult, because Tom only wanted one that had the chocolate glaze on top. Finally, I came across this recipe and decided to go for it. 1. Preheat oven to 350. Spray a large jelly roll pan with cooking spray, then place a sheet of parchment paper on top and spray that with cooking spray. 2. Add 3 oz. of chocolate and the butter to a large microwave safe bowl and microwave in 30 second intervals until the chocolate has fully melted. 5. Pour the batter onto the prepared jelly roll pan and spread evenly with a spatula. Bake for `5 minutes or until the cake springs back when touched lightly. 6. Remove from the oven and sprinkle the cake with 1/4 cup of powdered sugar. Quickly invert the cake onto a clean dish towel. Remove the parchment paper, and starting with the short end, roll the cake up in the dish towel. Transfer to a wire rack and allow to cool completely. 7. Beat together the cream cheese and 1/2 cup of powdered sugar until smooth. Stir in 1 1/2 cups of the thawed Cool Whip. 8. Gently unroll the cake. Spread the frosting mixture onto the cake, completely covering the surface area of the cake. Gently roll up the cake again and place seam-side down onto a plate or platter. 9. In a large plastic bowl, combine the remaining 3 oz. of chocolate and the 1 1/2 cups of Cool Whip. Microwave for 1-2 minutes or until the chocolate has completely melted. Stir until the mixture is blended. Cool for 2 minutes then spread over the cake. 10. Refrigerate for 1 hour before serving. Store leftover cake covered in the refrigerator for up to 4 days. As you can see, my cake broke on one side. I’m fairly certain that this has nothing to do with the recipe and has more to do with the fact that I used a waffle-printed dish towel. I was also pleasantly surprised to find out that this was really tasty! Granted, it will never be better than ice cream cake, but it was a decent slice of chocolate swirled goodness. Weekly Menu and Happy Easter! I love rolled up cakes no matter what they are filled with or what flavor the cake. This is a great addition to the ebony and ivory theme. perfect! That looks soooooooo yummy.